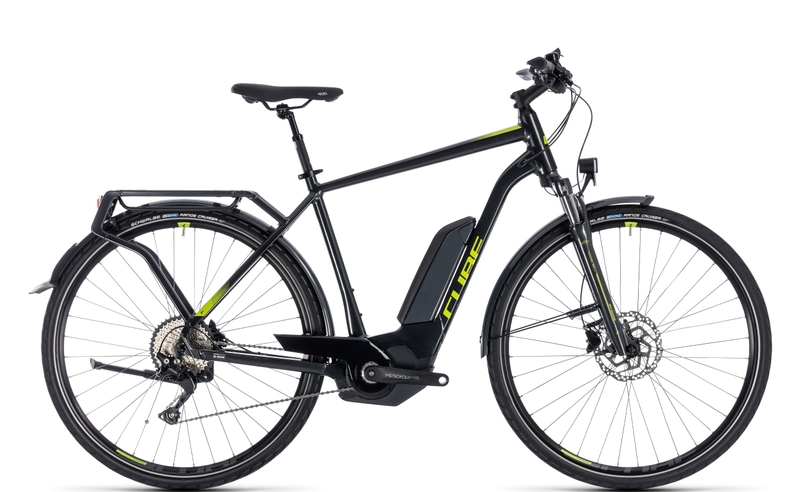 The new CUBE Kathmandu Hybrid Pro 500 is a super style touring e-bike built to combat the rigours of everyday life. Intended for wide appeal, the Kathmandu Hybrid Pro 500 is ideal for commuting, city use or for leisure rides in the countryside at weekends. This gritty performer from CUBE is reliable and user-friendly. Fully equipped for any eventuality, the Kathmandhu is a true all-rounder. Powered by Bosch’s high torque 75Nm Performance CX drive, the Kathmandu Hybrid Pro 500 overcomes every challenge with ease. A huge 500Wh battery ensures extensive rides that go on for miles and miles. This powerful combination of CX drive and 500Wh doesn’t feature on many touring e-bikes. The Kathmandu is indeed very special. At first glance this e-bike is purely a leisure companion. Look a little closer and the potential soon becomes apparent. Components on the Kathmandu Hybrid Pro 500 are excellent. Gearing is via a very nice Shimano Deore 10-speed derailleur. Thanks to Shimano’s Rapid Fire Plus shifters, changing gear is a breeze and effortless. A large 11-42T Shimano cassette facilitates great hill-climbing, especially with Bosch’s CX motor as the driving force. Shimano disc brakes provide effective and decisive braking via 180mm and 160mm rotors. Good quality brakes are a requirement with strong motor’s and the Kathmandu Hybrid Pro 500 has just that. Comfort is a priority on the Kathmandhu. Although a powerful e-bike in nature, there’s fine attention to detail that offers the rider both comfort and safety. The front forks with 63mm of travel are perfect for the job. They afford a comfortable ride and take all the vibration, bumps and knocks out. In addition, a suspended seat-post and Selle Royal gel saddle enhance the ride further. Powerful Trelock lights front and rear ensure visibility at all times. Tyres are puncture resistant. The Schwalbe Range Cruiser’s with Active, K-Guard are ideal for this type of e-bike and offer a good level of protection. An integrated strong rear carrier complements the frame beautifully and accepts a wide variety of luggage. The Kathmandu Hybrid Pro 500 is a flexible, fully functional e-bike with a difference!